Motion at large scale or universal dimensions versus motion at small or atomic scale. What concept or notion would you invent to describe the following image? Sir Isaac Newton used "quantitas motus" to describe what we refer to as "momentum"
Sir Isaac Newton used the term "Quantitas motus" or "Quantity of motion" as "arising from the velocity and quantity of matter conjointly" to describe the notion we currently refer to as "mometum" (Reference). Please consider also this reference & Aristotelian dynamics for the tem "Impetus" and the greek term "Oρμή" (represented in “hormone”). Motions of all large scale and familiar objects in the universe (such as projectiles, planets, cells, and humans) are described by classical mechanics. Whereas the motion of very small atomic and sub-atomic objects is described by quantum mechanics. Motion is described in terms of displacement (x), time (t), velocity (v), and acceleration (a). Linear motion (also called rectilinear motion) is a one-dimensional motion along a straight line. "A rotation is a circular movement of an object around a center (or point) of rotation. A three-dimensional object always rotates around an imaginary line called a rotation axis. If the axis passes through the body's center of mass, the body is said to rotate upon itself, or spin. A rotation about an external point, e.g. the Earth about the Sun, is called a revolution or orbital revolution, typically when it is produced by gravity." 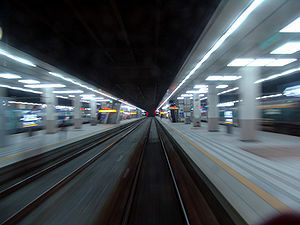 In linear motion, displacement is the distance traveled by the object. In rotational motion, the displacement is an angle and we therefore refer to “angular displacement”. 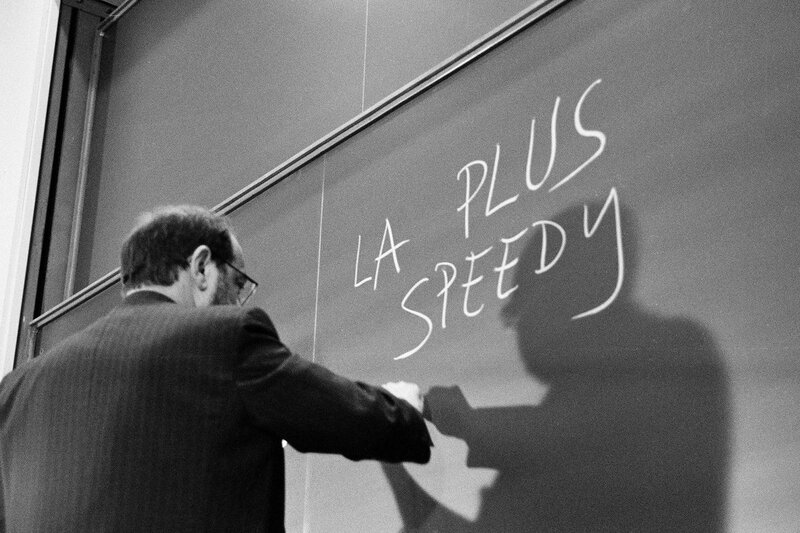 Generally, velocity is the displacement in the unit of time. Angular velocity is a vector (or pseudovector) whose magnitude measures the rate at which the radius sweeps out angle, and whose direction shows the principal axis of rotation. Its up-or-down direction is given by the right-hand rule. 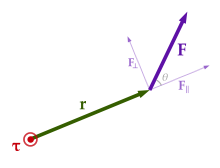 The angular velocity is measured relative to a chosen center point, called the origin (O in the next figure). The direction axis is the axis of the rotation, the reason being that a rotating object changes direction continuously and it is therefore difficult to track its direction (reference). Momentum is a quantity which is used for measuring the motion of an object. An object's momentum is directly related to the object's mass and velocity. The momentum of a particle, traditionally represented by the letter p, is the product its mass (m) times its velocity (v). It is a vector quantity, meaning it has both a magnitude and a direction. The moment of inertia has the same direction as the rotation axis. The angular momentum of a rigid object is defined as the product of the moment of inertia and the angular velocity. The angular momentum of a particle with respect to the origin O is a vector quantity defined as the cross product of cross product of the position vector r and the linear momentum p=mv of the particle. 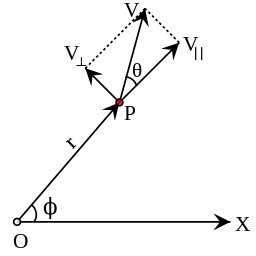 The angular momentum has meaning only with respect to a specific origin and its direction is always perpendicular to the plane formed by the position and linear momentum vectors r and p.
The above image from Wikipedia shows on the left an object that rotates upon itself (rotation axis passes from mass center) or "spins" and on the right an object that performs a rotation around an origin at distance r (it is in orbit around an origin). We refer to the first as having "spin angular momentum" S and to the second as having "orbital angular momentum" L. We can add the two vectors L and S to calculate the total angulal momentum J. 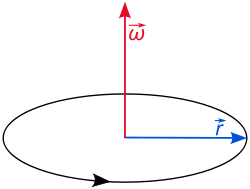 The above image from Wikipedia also shows the additions of the vectors of the two angular momenta to calculate total angular momentum. The conservation of angular momentum applies to the total angular momentum (not the individual components). Please also refer to https://en.wikipedia.org/wiki/Angular_momentum#Spin,_orbital,_and_total_angular_momentum. In physics, moment is a combination of a physical quantity and a distance. For example, a moment of force is the product of a force and its distance from an axis, which causes rotation about that axis. Magnetic (dipole) moment cf. Amperian loop model: (μ = Ι * S) (It represents the strength and orientation of a magnetic source). A knob is located as far away as possible from the axis that holds the door. By pushing the knob, you exert a force that rotates the heavy door on its axis (to open it). You are exerting a torque. What happens if you try to push the door at a point closer to the axis? More effort will be needed. Imagine that the door is represented in the Wikipedia figure below by the green arrow and that you exert the force F in purple on a specific point at the end of the radius vector r.
You analyze the force in two components. As the door is fixed on its axis, the FII (parallel) component cannot have any productive effect (it cannot pull the door out of its axis). Only the FI tangential component (the component that is perpendicular to the radius) can move/accelerate the door along its path. In this way we have analysed the motion in two linear components. How is this specific linear component related to angular acceleration? The quantity m * r2 is called rotational inertia, I. Rotational inertia is considered to be the rotational analog for mass. We could say that in rotation it is not only the mass that is important but also the distance of the mass from the axis (cf. knob on heavy door). Torque is "Force applied" times the "distance or radius away from the rotating axis". Determine the direction of the "torque". It is 90 degrees to the force and points outwards towards the reader. The more you apply the "torque", the more you increase the "angular momentum" of the wheel (the red arrow becomes stronger and stronger"). Let us consider a spinning top, the toy in the image below. When we spin a top it rotates (spins) around its (rotational) axis. After a while, it becomes instable, it wobbles. The rotation axis is no longer vertical but it tilts; there is an angle with the vertical axis. We say that the object "precesses". Can you imagine what kind of shape the axis creates in space? Note that as mentioned in wikipedia there is "gradual shift in the orientation of Earth's axis of rotation, which, similar to a wobbling top, traces out a pair of cones joined at their apices in a cycle of approximately 26,000 years. " > What is the cause of precession for a top? "The torque caused by the normal force (–Fg) and the weight of the top causes a change in the angular momentum L in the direction of that torque. This causes the top to precess." A rapidly spinning top will precess in a direction determined by the torque exerted by its weight. "Everything you need to know: Vernal (spring) equinox 2016"
>> "Great tilt gave Mars a new face"
Excerpt: "It wasn't the rotation axis of Mars that shifted (a process known as variation of obliquity) but rather the outer layers (mantle and crust) that rotated with respect to the inner core (...)." Extrait: "Ce n'est pas l'axe de rotation de Mars qui a bougé (phénomène que l'on appelle variation de l'obliquité) mais les parties externes (manteau, croûte) qui ont tourné par rapport au noyau interne (...)"
Let us examine what will happen if we have the wheel in the following setting and we let it go. Weight points down. This force is applied at a distance x (blue arrow) from its pivoting point (attached to the string). It will do a swing (around that point). But what if it is turning and we let it go? What is the direction of the "torque"? Indicated by the person's finger. Torque will shift angular momentum.